Christmas can be so awkward for new relationships. What should you get your boyfriend of just a few months or just a few weeks? When you are still getting to know someone and want to show your affection through a gift at the holidays, what to buy can be a tricky endeavor. CreditDonkey.com has valuable insight for you, based on our survey of over 600 guys that asked them what they like and dislike for Christmas gifts. Use the answers to determine the likelihood of your guy preferring a handmade scarf or a pair of cleats for his weekend soccer games. The results will surprise you. 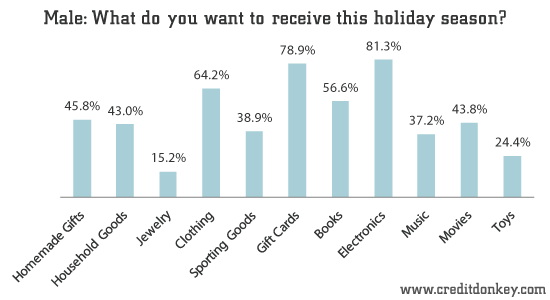 To begin, here are the tops things men said they do not want to receive for the holidays. Jewelry: Diamonds may be a girl’s best friend, but most guys have no interest in receiving jewelry for Christmas. With 85% saying they do not want it, guys are generally less wooed by “bling” than women. Music: With digital tunes on everyone’s phone or music player, getting music as a gift just isn’t what it used to be. Many people are used to buying and downloading their own music the minute they want a new song or album. It’s not surprising, then, that 63% of men do not want you to shell out for their music collection. Sporting goods: No matter how “manly” these sound, 61% of guys do not want sporting goods. Unless your boyfriend plays a sport and is in dire need of some new gear, this probably isn’t the best choice. He may just want to pick out what he needs himself. Household goods: Steer clear of the kitchen – 57% of our male respondents have no interest in getting appliances or other household goods. So despite how useful you think that George Foreman grill or paper shredder may be, it might not be the gift he is hoping to open. Movies: Getting your guy an action film, a comedy or another one of his favorite kind of flicks may seem like a great idea, but the majority of guys (56%) said they wouldn’t want to receive movies as a gift. This might be too much of a guessing game over what films he already owns. Electronics: A whopping 81% of men said they want electronics. With so many gadgets to choose from, you’ll definitely be able to find one he likes. Maybe he’s into photography and would love a new camera. Or maybe he’s been wanting an iPad. Options are endless in this category. Though not the most affordable of gifts, a new gadget will more than likely make his Christmas. Gift cards: These are always in style. Giving him the freedom to pick out his own things takes some of the pressure off you, and it’s almost certain to be a hit with him too, as it is for 79% of our survey respondents. Clothing: Almost everyone likes getting new clothes, including the majority (64%) of our male respondents. Whether he has a special occasion coming up or could just use a few new additions to his wardrobe, chances are he will be happy to get an outfit for Christmas. Share on Facebook "What Not to Buy Your Boyfriend for Christmas"